Internet auction sites. We all know them and many of us either love or despise their existence. Yet whatever one’s personal feelings towards the sale of personal artifacts on the internet, there is no denying the fact that these larger than life electronic garage sales have proven to be a tremendous source for military historians with a sharp eye for detail and bit of coin to spare. 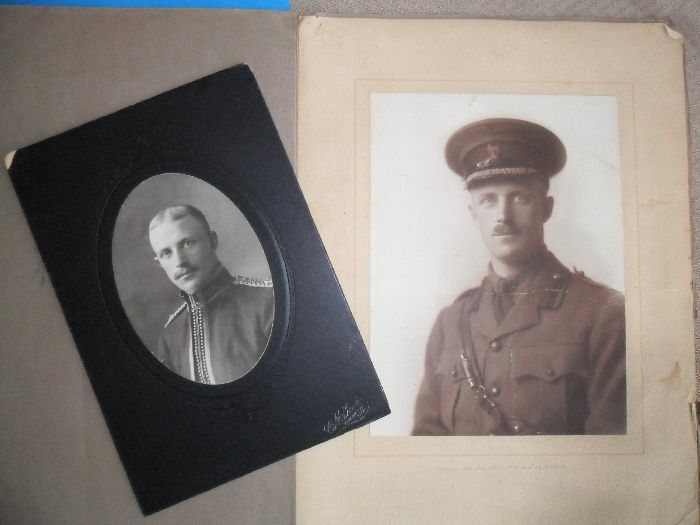 During a recent browse of online auctions, I came across a seemingly inconspicuous pile of letters and photographs concerning Lieutenant Colonel Alfred Earnest Shaw. The auction’s description of the contents gave little indication of who he was exactly, but did give indication that the items offered concerned the nature of his death. I bid on the material and won it for a very modest sum. I certainly knew who Lieutenant Colonel Shaw was and why he was important, but I could not have dreamed of how much more I was about to learn of him and his character when I received the package a short while later. Lieutenant Colonel Alfred Earnest Shaw was born in Millbrook, Ontario, on 21 November 1881, and served his country his entire life. Initially commissioned into the 3rd Dragoons, a militia unit, Shaw soon transferred to active duty with the Royal Northwest Mounted Police and later on, with Strathcona’s Horse. When the war began he raised and initially commanded the 6th Canadian Mounted Rifles, but as the various units were being amalgamated overseas Shaw was transferred over to the 1st Canadian Mounted Rifles (1 CMR). He assumed command of this unit a short while later. On 2 June 1916, the 3rd Canadian Division was severely attacked by the Imperial German Army’s XIII (Württemberg) Corps at Mount Sorrel in the Ypres salient. 1 CMR was defending the section of the front line when it was subjected to one of the most severe sustained enemy artillery bombardments in the war. Despite putting up a fierce resistance, the unit’s defensive positions were overrun by the enemy. Lieutenant Colonel Shaw was last seen with Major Fred Palmer, Officer Commanding C Company 1 CMR, organizing what remained of his battalion to make a last stand. The Battle for Mount Sorrel raged for nearly two more weeks and although the Canadians eventually retook the salient, many men, including Lieutenant Colonel Shaw, were never found. For a while it was assumed that he was taken prisoner. It was eventually learned that he had been killed. When the package arrived in the mail, needless to say I was a bit excited. The auction lot included photos of him, including an undated prewar portrait of him in dress uniform taken at the E.M Tait Studio in Edmonton, Alberta. Another portrait, taken at Swaine Studios on New Bond Street, London, reveals a still youthful face but with eyes emptied by war. Perhaps the last photo ever taken of Shaw before he was killed, the strain of combat can already be observed in his stare. The written materials included in the collection also give historians great insight into Shaw’s character. Among the official documents was his 1910 marriage certificate from the City of Winnipeg, which reveals that one of the witnesses to his wedding was H.D.B. Ketchen, later General Officer Commanding, 6th Canadian Infantry Brigade. There is also the official death scroll awarded on behalf of King George V, as well as his CEF Death Certificate accompanied by official condolence letters from Sam Hughes and the Adjutant General’s office. The personal documents and letters, however, are the most telling about the man. A typed letter of thanks from Lieutenant Colonel (later Major General) A.C. Macdonell dated 25 September 1914 expresses his personal gratitude to Shaw, a noted horseman and rider, for, “good work reference the horsing up of the [Lord Strathcona’s Horse (Royal Canadians)] – thanks to your energy, good judgement, and tact, we will go to England well horsed.” The next hand written document is Shaw’s personal will, which he wrote on 1 November 1915 after arriving in France – its content simply remarkable. “My horses are to be sold at public auction”, Shaw instructed, “with the exception of Molly McGuire which I leave to Douglas Cameron of Lord Strathcona’s Horse who will pay $100 to my estate for her keep…” Lieutenant Colonel Shaw owned a number of horses, including his favourites Tony, Buglar, Chocolate, Soldier, and Chestnut, all of which he instructed to be sold off or given away. Interestingly, however, Shaw could not bear the thought of someone else deciding the fate of “my favourite polo pony”, which he ordered was, “to be chloroformed and shot” in the event of his death. Beyond his horses, Shaw left all of his remaining saddles, personal effects, money, as well as a sizeable amount of land to his beloved wife Katherine. Lieutenant Colonel Shaw was a respected and well-liked Commanding Officer who led from the front and fought alongside his men. His death resulted in a number of very personal letters of condolence to his wife, the earliest among these being penned on 18 June 1916 while sporadic fighting was still underway at Mount Sorrel and the surrounding Ypres Salient. A short note from A.C. Macdonell to Mrs. Shaw highlighted her husband’s gallantry in action on several occasions, “in particular when he saved the aviator and we all hoped he would receive the V.C.”. What event Macdonell was referring to exactly is still unknown, but it provides yet another facet of this gentleman’s career that needs to be explored. May I be allowed as a wounded private in your late husband’s regiment to offer you my deepest sympathy in your great bereavement. When I first went to Canada ten years ago Colonel Shaw, then Inspector in the mounted police, was the first Canadian to give me a helping hand. Owing the ten years I spent in Canada, I never forgot the good advice and assistance he gave me, then a stranger in a strange land. It was therefore extremely gratifying to know that he had been appointed C.O. to the battalion in which I was serving. Never was there a more popular or respected Commanding Officer. It was a common feeling throughout the battalion, that it was entirely due to the good advice and excellent management of our colonel that the casualties of the battalion were kept so low during the earlier part of our tour in the salient, and I don’t think there were any of us but would have gone anywhere with him, as like all good soldiers he never asked a man to do anything he wouldn’t do himself. I hope you will not consider me presumptuous in writing to you, but I felt that I must let you know how deeply we in the ranks that are still alive, sympathize with you and ourselves mourn a very gallant officer whom we shall never forget. In addition to the items highlighted here, this small collection includes letters from the various chaplains of the brigade and division, as well as letters from other fellow officers and soldiers who had known Shaw. Each note offers a unique perspective into his character, and combined they paint the portrait of man who was strong, self confident, and well liked by his peers and subordinates. There is little doubt that he was a respected combat leader, and his loss was an obvious blow to the morale of his unit. Though this blog has only briefly introduced Lieutenant Colonel Shaw, the letters and effects concerning his death offer new and unique insight into the life and last days of a Canadian Commanding Officer who fought at the Battle of Mount Sorrel and did not survive the war. Library and Archives Canada [LAC]. RG150, Acc 1992-93/166 Box 8814-33. Personnel File of Alfred Earnest Shaw. Major Fred Palmer was taken prisoner on 2 June 1916 and later incarcerated at Gütersloh, Germany. LCol A.E. Shaw, CO 1CMR, is commemorated on the Ypres (Menin Gate) War Memorial. Andrew Godefroy Collection [AGC]. Manuscript Group [MG] 1. Alfred Earnest Shaw Papers. Letter from LCol A.C. Macdonell to Captain A.E. Shaw, B Sqn LSH (RC) at Valcartier, Quebec, dated 25 September 1914. AGC. Ibid. Personal Will dated at France, 1 November 1915. AGC. Ibid. Alfred Earnest Shaw Papers. Letter from A.C. Macdonell to Mrs. K.E. Shaw, dated 18 June 1916. AGC. Ibid. Undated letter (presumed June or July 1916) from Pte. C.S. Cole, 1st CMR, at No.3 Canadian General Hospital, Boulogne, to Mrs. Shaw. An interesting article. I believe the Douglas Cameron to whom the horse, Molly McGuire, was my grandfather himself a noted horseman. Hello Andrew. Very interesting! I’m slowly building a 1st C.M.R. website, my connection being my Grandfather – Major (Lt.-Col.) W.E.Maxfield D.S.O. (“A” Squadron/Company). I would very much like to add a piece about Lt.-Col. Shaw. Best wishes, Pete. Major Fred Palmer was the other Senior Major with my Grandfather in 1914, both joining from the XII Manitoba Dragoons. I thought he must have been taken prisoner at Sanctuary Wood, but wasn’t sure until now – thank you! The best account I’ve come across of the Battle of Mount Sorrel (The 1st CMR were on Observatory Ridge), is in the book – ‘A Canadian Soldier: George Harold Baker, M.P., Lieutenant Colonel, 5th C.M.R., (Killed in Action at Ypres, June 2nd, 1916. )’ Extracts from his, and other’s letters; and also includes the official account. It’s online, and available as a reprint (on demand). This has helped me fill some family history gaps. AE Shaw’s wife Emily Katherine nee Thomason 1881-1949 was the granddaughter of my ancestor Sarah Randall 1835-1901. Emily was a farmer’s daughter, born at Ridgmont, Bedfordshire, England. She emigrated to Calgary in 1906 with her widowed mother, to join her married sister Marion Mountfort Bates, who had emigrated 2 years previously. The Bates family were renowned architects and artists, and I am still in the process of tracing current descendants.